The battleship HMS Queen Elizabeth served though both world wars, but saw surprisingly little action. During the Battle of Jutland, she was undergoing refit. In World War Two, already approaching obsolescence, she was damaged by Italian divers while at anchor in Alexandria, Egypt. Subsequently, she was repaired in the United States and then served in the Pacific. When she was launched, she was the fastest, most powerful warship afloat. Boasting 15 inch guns and burning diesel fuel, rather than coal, nothing could catch her, nor could anything outgun her. 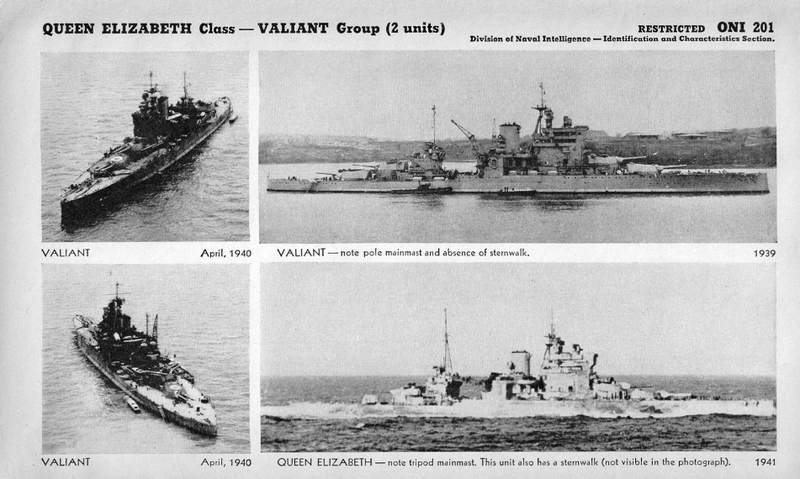 Originally planned to carry ten guns, the Royal Navy decided on eight, trading off the extra firepower for speed. Since none of her contemporaries carried anything bigger than 14 inches, it was a good call. Using oil was a decided advantage. Burning more efficiently than coal, it permitted her a top speed of 24 knots, faster than any contemporary battleships, and as fast as the battle-cruisers of the day (which she over-matched in hitting power). Oil burned more cleanly, with less smoke to identify the ship's position and to obscure her own gunners. Fuel oil was wholly less labor-intensive, obviating the need for attendant coaling ships and teams of stokers needed to shovel coal into the hellish ovens of coal-burning ships. She was built at Portsmouth Dockyard, being laid down in October 1912 and completed January 1915, at a cost £3,014,103. HMS Queen Elizabeth measured 639 feet 9 inches in length, 90 feet 8 inches in beam. She drew 33 feet and displaced 27,470 tons (light). Powered by 4 shaft Parsons/Brown Curtis turbines, generating 56,000 horsepower (or 75,000 at overload), she could achieve 24 knots. She was protected by a main belt of steel armor-plate, 13 inches at its thickest, 10 to 4 inches on the barbettes, 13 inches for the turret faces, and 3 to 2 inches covering the decks. Armament: eight 15-inch main guns (in 4 double turrets), fourteen 6-inch guns in single mounts, several smaller guns, and four torpedo tubes. 19 February 1915 arrived at the Dardanelles and saw action bombarding forts. During which she was hit by shore batteries but no serious damage. 27 April 1915 fired on the former SMS Goeben overland using a kite balloon for spotting. 12 May sent home from Dardanelles owing to risk from submarines. 26 May arrived at Scapa flow and joined the 5th Battle Squadron. Not present at Jutland as undergoing refit. November 1916 - February 1917 refit at Newcastle to enable her to become Grand Fleet flagship for Admiral Sir David Beatty. 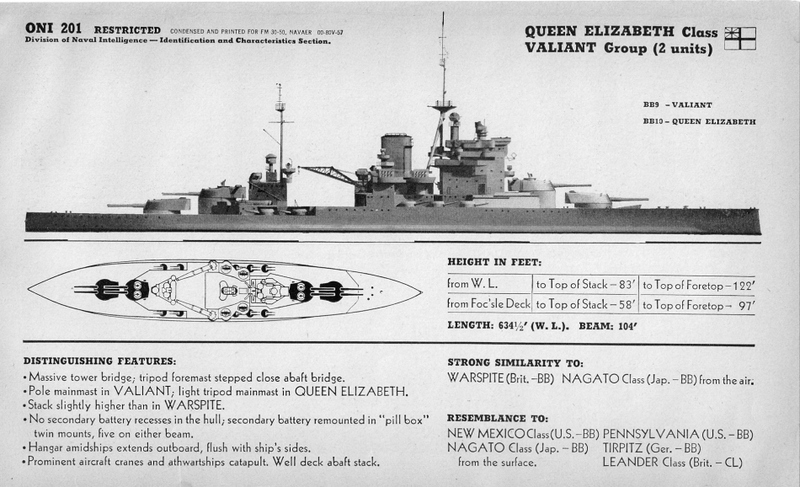 Queen Elizabeth served as the flagship of the Atlantic Fleet until 1924, and as flagship of the Mediterranean Fleet after that. Although she remained an impressive ship, changes in naval warfare required updates to the original design, thus she was rebuilt twice between Wars. 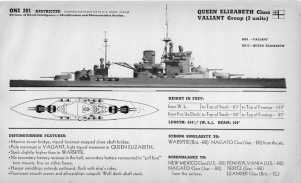 In the second rebuild both HMS Queen Elizabeth and HMS Valiant remained almost identical sister ships, the difference being HMS Queen Elizabeth had a tripod mainmast, HMS Valiant a pole mainmast. The changes included improvements to the main guns, allowing 30 degree elevation increasing their range to 32,000 yards. All the secondary armament was replaced with 20 4.5 inch AA gun mounts (10 x 2) (as installed on the Illustrious-Class aircraft carriers). 32 2 pdr pom pom guns (4 x 8) were fitted around the funnel, 16 0.5" (4x4) machine guns were fitted, two on B and 2 on X turret roofs, but these were quickly removed. New aircraft arrangements were made to accommodate 3 aircraft with an athwartships catapult. During World War II, she was part of the Mediterranean Fleet. She was mined and sunk by an Italian human torpedo attack on 18 December 1941 in shallow water in the harbour at Alexandria, Egypt. Although low in the water, her decks were clear and the Italian crews were captured. She was able to maintain the illusion of full operational status, concealing the weak British position in the Mediterranean, until raised and patched up for the journey to the United States Navy Yard in Norfolk, Virginia where she was repaired. From there she was sent to the Pacific, where she served from 1944, taking part in raids on Japanese bases in Indonesia. Throughout the war changes were being made to the anti-aircraft weapons as the threat increased. By the end of the war, she carried fifty-two 20 mm Oerlikons anti-aircraft guns. Her radar-based fire control also improved. Four fire control towers were fitted: two above and forward of the bridge and two aft. Constantly improving radar sets for gun control, air warning, and IFF were installed. She returned to Britain in July 1945, and was sold for scrap in March 1948. Decommissioned to reserve on 10 August 1945. Sold on 19 March 1948 to Arnott Young, arrived at Dalmuir for scrapping on 7 July 1948. Read more about HMS Queen Elizabeth here.